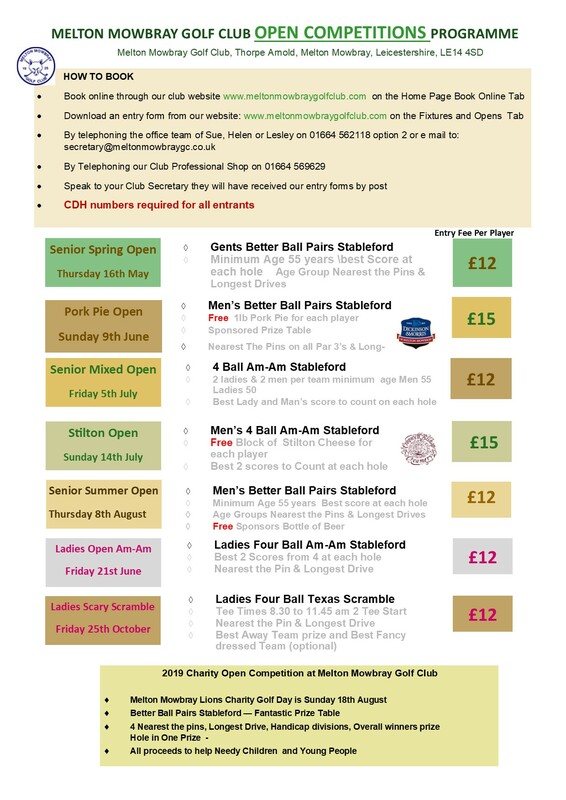 You can be sure of a warm and friendly welcome at Melton Mowbray Golf Club and we look forward to welcoming you to our Open Competitions in 2019. Our friendly staff will be pleased to help you and our Club Captain or Lady Captain will be present at the prize giving. 2019 will offer you a new challenge as we have made some considerable changes to our course. You can download entry forms from the table further below on this page; they are also available by contacting Alison, Helen or Lesley on 01664 562118 (Option 2). In addition, all of our Opens can be booked online, with the exception of The Ladies’ Scary Scramble. Catering is available all day during Open Competitions with “specials” and a full bar menu to choose from. Information about these will be available from our friendly helpers at the booking-in table on your arrival. 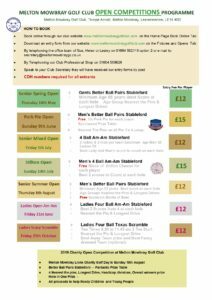 Our 2019 Open Competition Entry Forms are available to download below and you can also book online (except for the Ladies Scary Scramble). Please provide the CDH numbers for each player on the entry form. These can be obtained from your Club Office or Competitions/Handicapping Committee. NOT AVAILABLE TO BOOK ONLINE PLEASE SEND ENTRY FORM OR RING 01664 562118 option 2 to book and pay over the telephone.